Polar bears are gigantic creatures with big appetites. While they subsist mostly on ringed seals, they eat many things including beluga whales. In winter, polar bears also eat walrus calves, fish, and muskox. During the Arctic summer, they eat small mammals, birds, and eggs. They hunt by stalking resting seals or by using their webbed paws to dog-paddle to reach prey in the ocean. Believe it or not, the Arctic is colder than Wisconsin in winter. 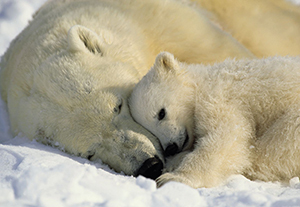 Polar bears’ fur collects light from the sun, which keeps their skin warm and allows them to survive the Arctic cold. Male polar bears stay active throughout the harsh winter by hunting and play-fighting with others. Play-fighting makes them stronger and better hunters. In autumn, female polar bears start digging dens in snowbanks. In late December or early January, they usually give birth to their cubs, most of the time to twins. In March or April, the family breaks out of its den. It takes the cubs about two years to learn how to hunt. Polar bears are very interesting creatures, and there's so much to learn about them!